The power of social media was apparent last night when a posting for a lost dog lead to a successful reuniting of pet with family, only a mere two hours after the post went up. Two days ago, a Sacramento citizen realized that her dog escaped from their backyard. After scurrying on the web to search for the lab—from posting information on Nextdoor to searching shelter websites—and even calling the City’s Animal Care, it lead to the idea of posting the dog’s picture on the Front Street Animal Shelter’s Facebook page. 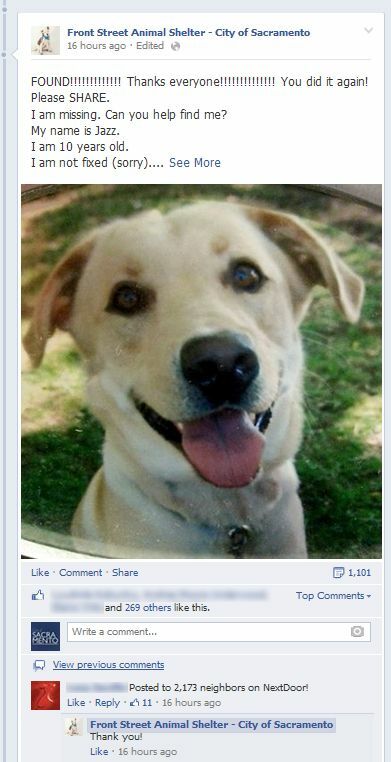 The page, which has more than 13,000 followers, was ground zero for finding the dog named Jazz. Within an hours, more than 266 likes were generated and a whopping 71 comments. The brainstorming of ideas and leads began. In addition to those likes and comments, more than 1,000 people shared the post on their wall, creating an impromptu campaign to find Jazz. After only a couple of hours, a concerned animal lover posted that she saw an ad on Craigslist about the lost dog. The dog owner called the number on the ad and by 10:30 p.m. –just two hours after the post– the dog was found. Visit the Front Street Shelter Facebook page to learn more about amazing programs and the people behind them.